A night of miming, dancing and laughter, one that you won’t forget! This is sure to blow your mind off! Come and enjoy our traditional mouth-watering food also! This event will be one to remember! 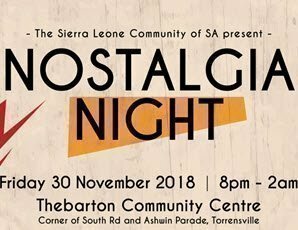 The Sierra Leonean Community is ready to take you on a trip down memory lane! This is an opportunity for you to wear that lovely 70s outfit which will remind you of the good old days! Ticket is only $25 for Adults and VIP $40. You don’t want to be told! You will regret it, if you miss it! So don’t miss it! Book Now!